As a Mom, I try to stay away from the yoga pants trap. I may work from home and certainly don’t get dressed EVERY day, but I love denim and jeans are what you'll find me wearing 99% of the time. They are the perfect thing to dress up or down and they fit my casual-chic style. That being said I try new jeans all of the time and finding good jeans is exciting. In my mind the perfect pair of skinny jeans is slimming, slightly stretchy, either super dark or distressed and it doesn't break the bank. It's really hard to find all of those things in a pair of jeans. Believe me, I have a closet full of denim that meets one or two or three, but not all of those requirements. So when Levi's® reached out to me to try their new Levi’s® 711 Skinny jeans, I was all ears... or...legs. I was happy to try them and I had high hopes for finding a new favorite. And I'm here to say they've been approved for entering my current denim rotation. These are skinny jean winners and regardless of whether flares or cropped denim styles are coming back in, every girl needs some good skinny jeans. 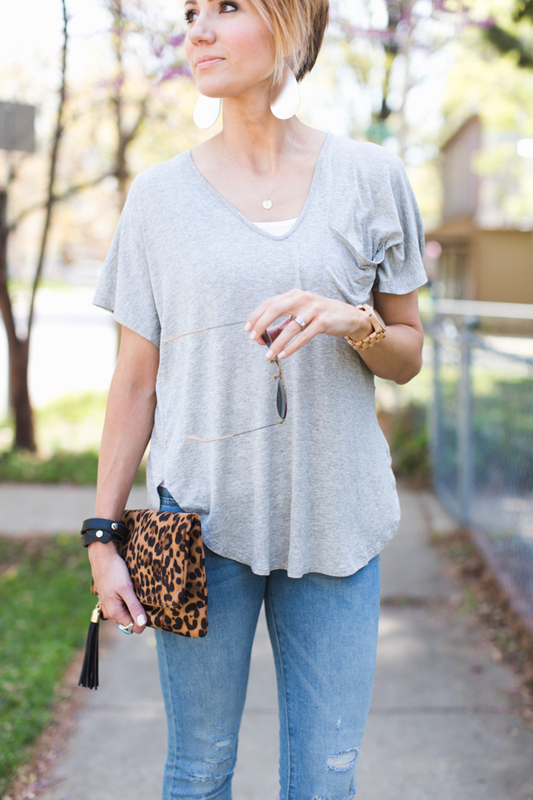 I tried these jeans in this light and distressed wash, as well as in a super dark wash. I love the wash on both pairs as they are perfect for Spring tops and shoes. As you can see, I’ve styled them today with an over sized tee and wedges with a wide cuff at the ankle. This light pair will also go great with graphic tees, stripes, sneakers and Birks. They don't stretch out, but they do stretch. They hold you in and up in the right places, but they don't feel restrictive. I've actually been frustrated for the last few days because they've been in the laundry and every time I go to get dressed I'm cursing for not having washed them yet. And remember how I said I want jeans that don't break the bank? These pants are only $40 which makes them affordable and easy to say yes to. I know you know that it’s hard to find jeans that make you look and feel good for under $50. This fit and style is available at Macy's in store and online. If you don't get out much, like myself, order them online and try them out at home. My goals is to always share outfits that moms and busy women can wear that don’t require a lot of fuss, but still keep you feeling unique and put together. This requires great staples and well-fitting basics. Levi's® has always had that effortless and cool style that fits with that goal and you'll be seeing more of these as I style outfits this season. When was the last time you bought skinny jeans that you felt great in? You look amazing in those jeans. Thanks for sharing! Do you know the color name for the distressed ones you are wearing? Both links go to the dark and I'd love to buy the distressed! Thanks! Hi! Yes, this wash is called Lasting Damage. I love the leopard and the pop of color in the shoes . . . it really brings the whole look together . . . fabulous!